Delecata squash is a cute little winter variety with beautiful yellow and green stripes. Named because of its delicate skin, delecata squash doesn’t need to be peeled, making it even easier to prepare. The first time I tried delecata squash, it arrived in a box on our front porch from a local farm (part of a CSA program). I have been a fan ever since. 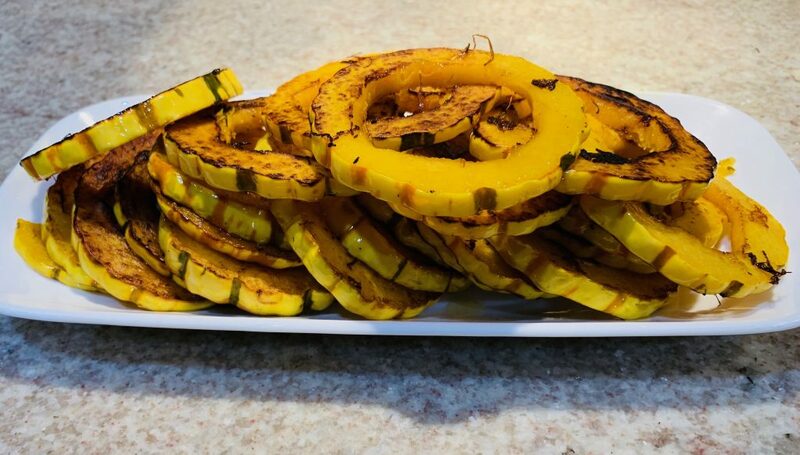 The kids love the sweet flavor and creamy texture of this squash too. 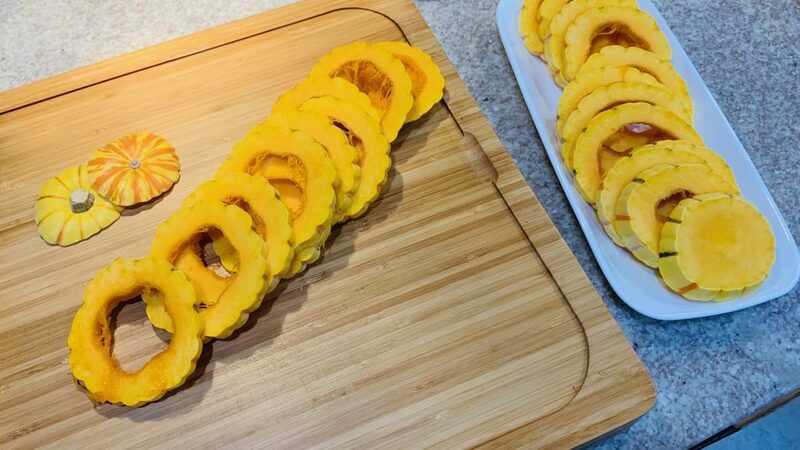 To cut the squash into these fun rings, first cut it in half width-wise and scoop out the seeds. Once the inside is cleaned out, slice into 1/4 inch rings and discard the ends. 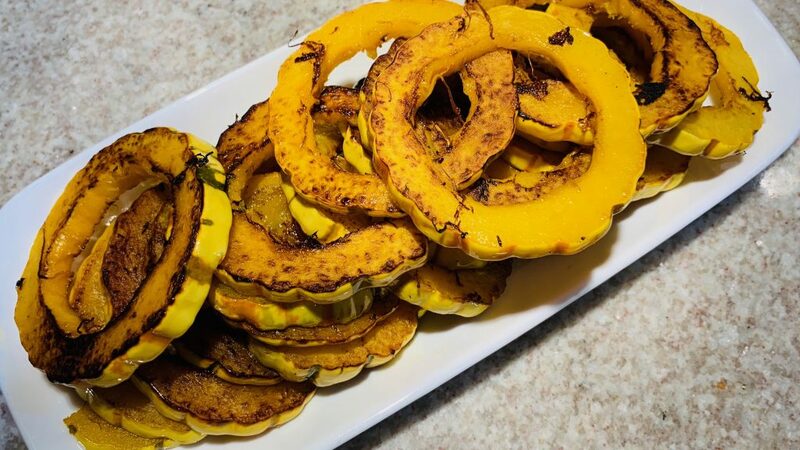 I got 23 rings out of my squash. 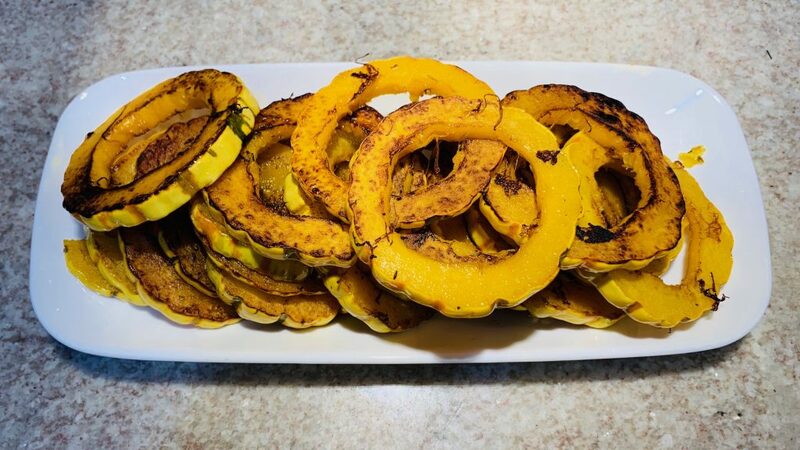 For this Delecata Squash Recipe, simply pan fry the rings in a little olive oil, over medium heat. Only fry one layer at a time, making sure not to over-crowd the pan. Turn over when the rings are golden and slightly caramelized. Continue until all your rings are cooked. Delecata squash, also know as sweet potato squash, is lower in net carbohydrates than some of the other winter squash varieties. It’s also a great low-carb alternative to sweet potatoes. 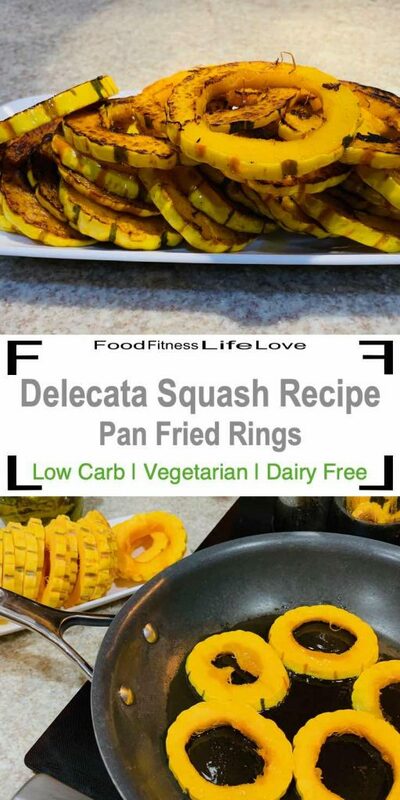 With only 6 net carbs per serving, delecata squash can easily fit into a Keto lifestyle. Just keep track of the rest of your macros for the day. These tasty golden rings are great as part of a meal. They are also the perfect size for finger food and make a delicious snack. 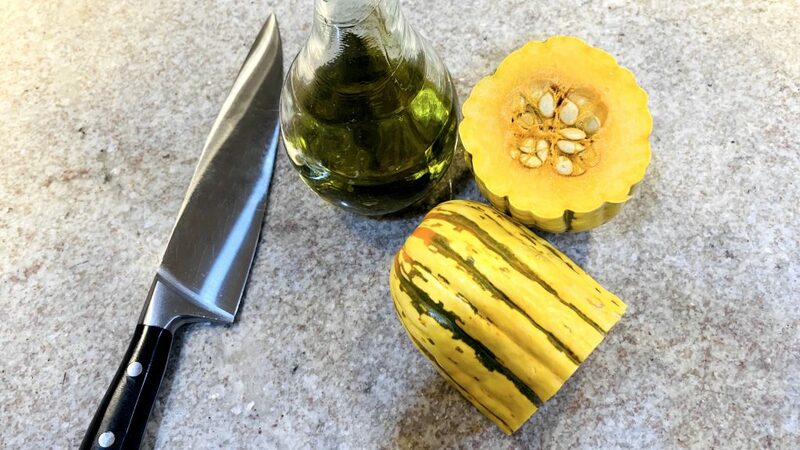 Cut the squash in half, width-wise, and remove the seeds. Cut off the ends and discard. Slice into 1/4 inch rings. Drizzle olive oil in a non-stick fry pan over medium heat. 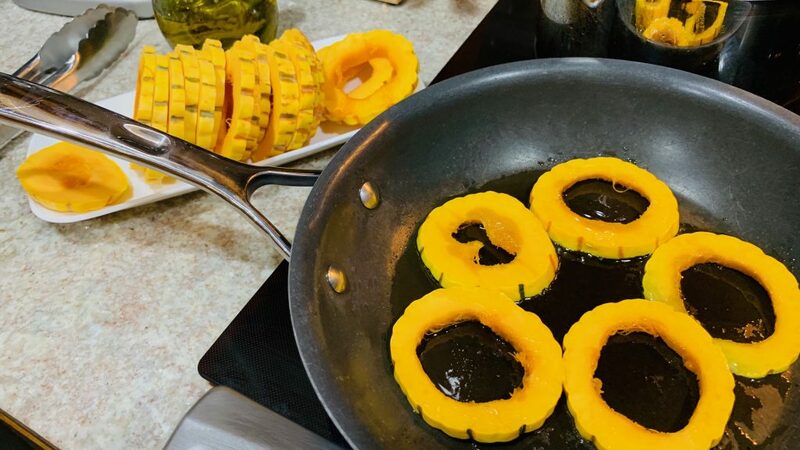 Once the pan is warmed up, add one layer of delecata squash rings to the pan. Fry 3-4 minutes until the rings are golden. Flip over and repeat on the other side. 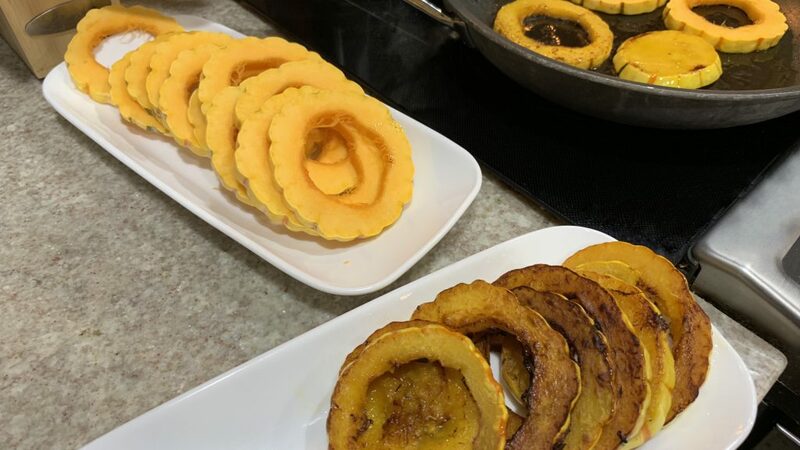 Once the delecata squash rings are fully cooked, remove from the pan and repeat the process with another batch of rings until they are all cooked. Serve and enjoy.